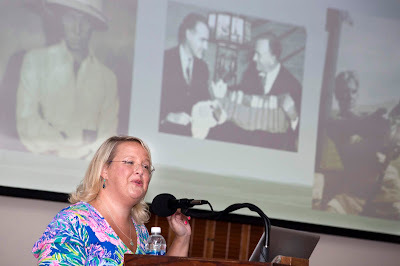 Ashley Oliphant Ph.D., Hemingway scholar and professor of English at Pfeiffer University, discussed her most recent book, “Hemingway and Bimini: The Birth of Sport Fishing at ‘The End of the World’”, at the second annual Key West Art & Historical Society Hemingway Days Symposium, held at Old City Hall in Key West, Florida on Tuesday evening. 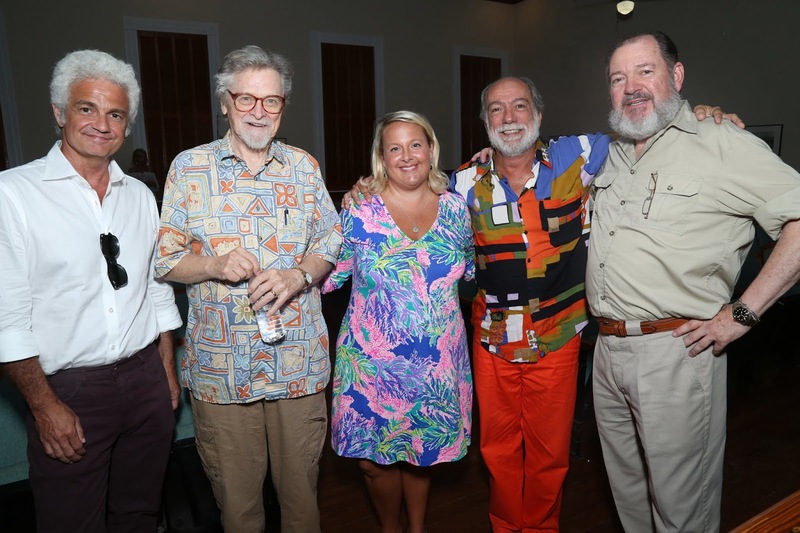 Her book explores the emergence of big game fishing as an organized, competitive sport during the 1930s, when Hemingway lived on the westernmost island of the Bahamas. Pictured in the slide behind her are historic sport fishing icons: angler and game fish expert Van Campen Heilner, journalist and sport fisherman Kip Farrington with International Game Fish Association founder Michael Lerner, and famed novelist Zane Grey, also recognized as a pioneering angler. Dave Gonzalez, Museum Curator for the Ernest Hemingway Home in Key West, fourth from left, joins Hemingway scholars, authors, and experts (left to right) Kirk Curnutt, Ph.D., Brewster Chamberlin, Ashley Oliphant Ph.D., and Brian Gordon Sinclair on Tuesday evening following the second annual Key West Art & Historical Society Hemingway DaysSymposium, one of several Hemingway Days festival literary components presented by the Society.